Wellington Saints (NBL) strengthened their roster with addition of 27-year old New Zealander international forward Robert Loe (211-111kg-91, college: St.Louis). He just played at Taipans in Australian NBL league. In 28 games he recorded 7.6ppg, 5.0rpg and 1.3apg this season. The last season Loe played at New Zealand Breakers where in 30 NBL games he averaged 7.3ppg, 4.3rpg and 1.1apg. He helped them to make it to the semifinals. Loe has tried to make it to the NBA and played in the NBA Pro Summer League in 2014. He has been also a member of New Zealand international program for some years. Loe has regularly played for New Zealand senior team since 2009 and previously for U20 National Team back in 2006. He represented New Zealand at the Commonwealth Games in Gold Coast (Australia) last year. Loe's team won Bronze and his stats at that event were 5 games: 9.4ppg, 5.0rpg, 2.4apg, 1.4bpg, FGP: 40.7%, 3PT: 53.3%, FT: 50.0%. 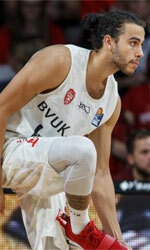 Loe has played previously professionally in Belgium (Limburg United) and Greece (KAO Dramas). He attended Saint Louis University until 2014 and it is his fifth season as a professional player. The scouts decsribe him following way: A big bodied PF who can easily spend time in the 5 position too. Has good offensive skills with a great shooting touch.